In Snacks Quarterly, writers and designers turn snacktime into an unlikely creative exercise. Snacks are a mighty and undersung unifier: most people, regardless of creed, class, or dietary restriction, can agree that little morsels of food between meals are great. Snacks Quarterly, an online publication “for the distinguished snack enthusiast,” was launched in early 2014 by artists Brad Simon and Alexander Barrett as an outlet to share their passion for snacking. Since their launch, they’ve published snack-related essays, illustrations, anecdotes, and advice by designers like Erik Marinovich, Josh Cochran, Tim Lahan, Aaron Draplin, Jessica Hische, Brian Rea, Will Bryant, and Dan Christofferson. The quarterly’s third issue has just been released, introduced with a rousing letter from editor-in-chief “Sinclair P. Munch,” which reminds readers that designers can find inspiration in the unlikeliest of places, from White Fudge Oreos to Little Debbie’s Christmas Tree Cakes. The publication makes snacking seem downright virtuous: you’re not just gorging on empty calories, you’re engaging with a powerful muse. The inspiration for Snacks Quarterly struck in late 2013, while Barrett and Simon were in the studio printing a poster about snacks, just for fun. Somewhere on the poster, “Snack Quarterly” showed up in a New Yorker-style font. “It seemed like a real thing,” Barrett says. “Surprisingly, the url was available, which seemed like a sign.” The pair started emailing back and forth, added an “s” to the end of “Snack,” and the first issue was up a few months later. 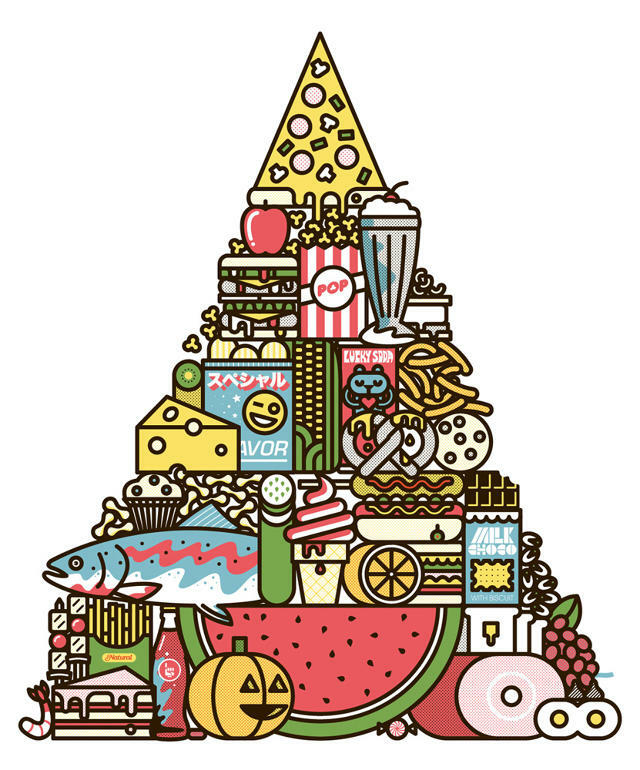 Mike Davis of Burlesque Design illustrated an epic pyramid of snacks of all shapes and sizes, from watermelons to popcorn to Swiss cheese to whole fish. Typographer extraordinaire Jessica Hische spelled “More Salt”–which many of the best snacks have–in elegant letters made of, yes, salt. Read the third issue of Snacks Quarterly here.